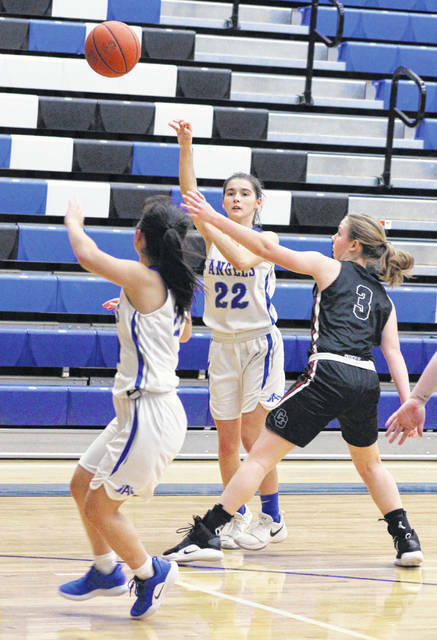 Gallia Academy sophomore Koren Truance (15) looks to make a pass into the low block during the second half of Thursday night’s girls basketball game against Coal Grove in Centenary, Ohio. Gallia Academy junior Chasity Adams (22) makes a pass to teammate Junon Ohmura during the second half of Thursday night’s girls basketball game against Coal Grove in Centenary, Ohio. CENTENARY, Ohio — Great start. Not so great finish. 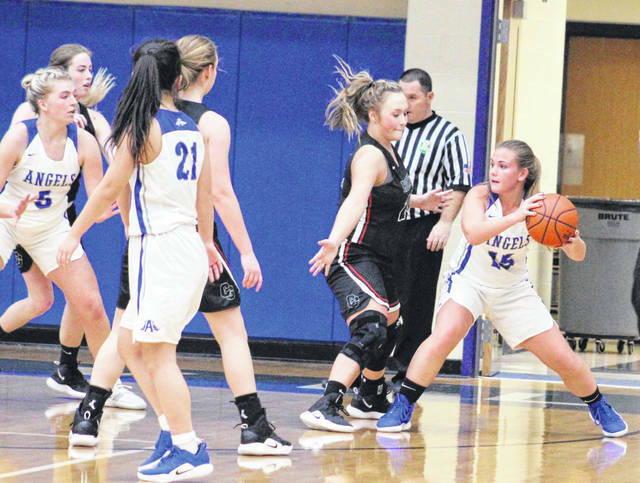 The Gallia Academy girls basketball team put up a gutsy fight for roughly 12 minutes, but visiting Coal Grove broke away from a 21-all tie with a 37-12 surge over the next dozen minutes and ultimately cruised to a 71-40 decision on Thursday night in an Ohio Valley Conference contest in Gallia County. The host Blue Angels (6-11, 2-8 OVC) battled through four ties and six lead changes while securing the largest lead of the opening quarter at 18-15, but the Lady Hornets (13-4, 8-2) countered with a 6-3 run to start the second frame that ultimately knotted the game at 21-all with 5:28 remaining. Abbey Hicks netted two free throws 27 seconds later that provided CGHS with a permanent lead of 23-21. Those charity tosses also sparked a small 4-1 run over the next minute, giving the Red and Black a 25-22 edge with four minutes left until halftime. The Lady Hornets reeled off 10 consecutive points over the next three minutes while building their largest lead of the first half at 35-22, but a Maddy Petro basket with 48 seconds left ultimately trimmed the deficit down to 11 points entering the break. Coal Grove hit its first three shot attempts of the second half and made a 12-2 charge over the opening 3:15 of the third, then closed the canto with a small 11-9 run to secure a 58-33 cushion entering the fourth. The Lady Hornets twice led by as many as 35 points, the last of which came at 71-37 on a Rylee Harmon bucket with two minutes left in regulation. Brooklyn Hill tacked on a free throw and a basket down the stretch to wrap up the 31-point outcome. 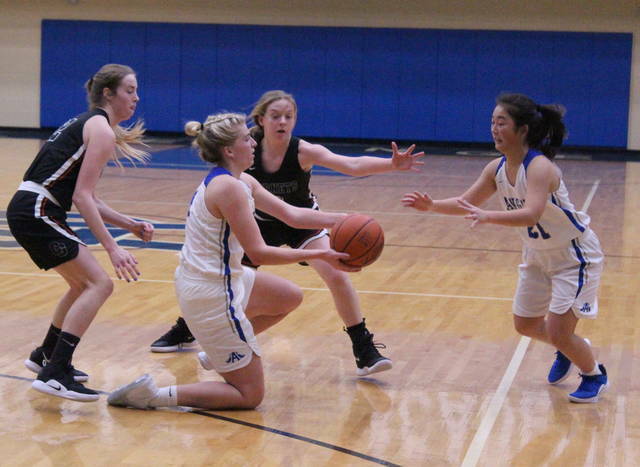 With the setback, the Blue and White were swept in the regular season after dropping a 58-28 decision at CGHS back on Dec. 10, 2018. The Blue Angels made 8-of-15 shot attempts in the opening eight minutes, but managed only seven baskets the rest of the way. The hosts also produced only a dozen shot attempts while committing 14 turnovers after halftime. The Lady Hornets outrebounded GAHS by a 38-21 overall margin, including a 26-6 edge on the offensive glass. 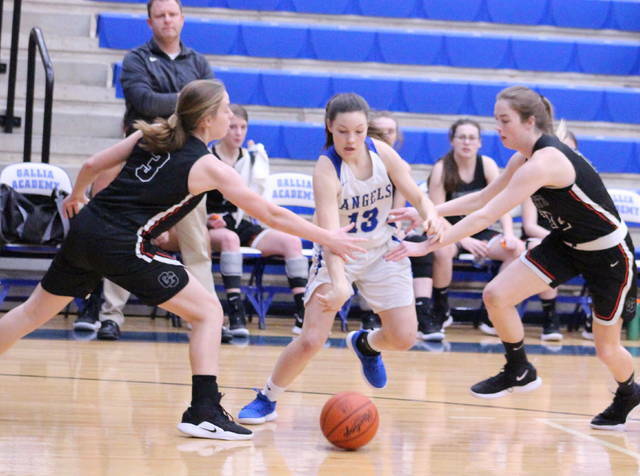 Both teams committed four turnovers in the opening stanza, but the Blue Angels finished the night with 25 total miscues. CGHS had only nine turnovers in the game. Gallia Academy made 15-of-39 field goal attempts for 38 percent, including a 1-of-7 effort from behind the arc for 14 percent. The hosts were also 9-of-14 at the free throw line for 64 percent. Hill paced the Blue and White with 12 points, followed by Petro with 11 points and Junon Ohmura with eight markers. Preslee Reed and Koren Truance completed the scoring with respective efforts of seven and two points. Petro led the hosts with eight rebounds, followed by Hill with five boards and Katie Carpenter with four caroms. Coal Grove netted 29-of-76 shot attempts for 38 percent, including a 4-of-16 effort from behind the arc for 25 percent. The guests were also 9-of-13 at the charity stripe for 69 percent. Baylee McKnight led the Lady Hornets with a game-high 19 points, followed by Addi Dillow with 16 points and Destiny Dolen with a double-double effort of 10 points and 11 rebounds. Jaiden Griffith was next with nine points and Lauren Crum added seven markers, while Hicks and Kaleigh Murphy each contributed four points. Harmon completed the winning tally with two markers. The Blue Angels return to action Monday when they travel to South Point for an OVC contest at 6 p.m.